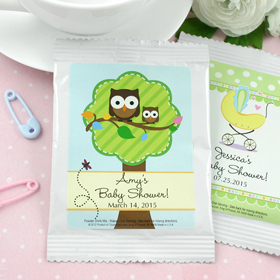 These yummy Cappuccino baby shower favors are sure to please everyone. There's nothing like a creamy decadent cup of cappuccino to enjoy while celebrating at your baby shower. These also make a clever birth announcement you can personalize and then send out. Each single serving of cappuccino mix comes sealed in a (4"w x 5 1/2"h) envelope that contains the perfect amount to create one delicious drink. Made in the USA! Instructions are on the back on how to mix the contents to create the perfect cup. Each custom label can be personalized with three lines of text and is easily applied to each drink mix by you. Assembly: These favors come bulk packed with your self sticking label sheets included, for easy application. Processing Time 2-4 business days. Does not include shipping time. Please read the Description below the picture for instructions on how to choose your design.